If your infection has spread into the bone that supports your teeth, and is below the level that can be reached in "Upper Level Infection Removal", then a surgical procedure must be performed to retract the gums and remove the lower level infection. 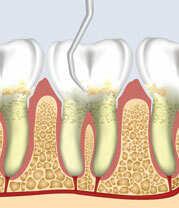 When periodontal disease reaches this lower level, it dissolves the bone around the teeth and can lead to bone loss. 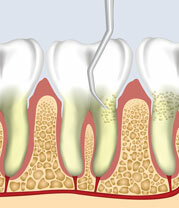 Once the infection has been removed, we repair the damaged area with a procedure called Bone Grafting. Click here for more information on that procedure.